FOREIGN TRIPSAli Kiba was accompanied by his younger brother Abdu Kiba, his best man. WATER DESALINATIONOn another tour to Spain, which he made after returning from Estonia, Mr Joho said on social media that he had a "fruitful" engagement with the Spanish Government on the development of water desalination plants. 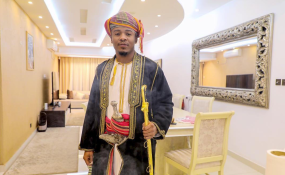 PRIVATE RECEPTIONAfter the wedding, Ali Kiba went to the house of Governor Joho's brother, Abubakar Joho, in Kizingo, for a ceremonial wedding meal known as "Kombe la bwana harusi" (groom's cup). BLESSED UNIONShe met the Tanzanian music star during many of his frequent visits to the county.